V2511. 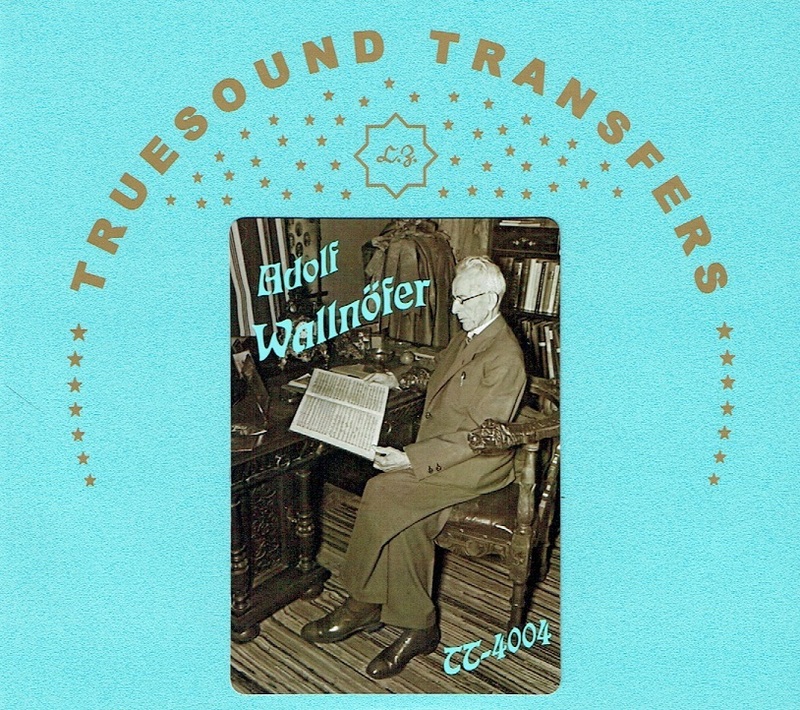 ADOLF WALLN�FER: Songs by Rubinstein, Schumann, Mendelssohn & Walln�fer; Arias from Le Proph�te, Pagliacci, Meistersinger, Lohengrin & Siegfried - recorded 1905-33; Adolf Mennerich Cond. Lorenz Fehenberger & Anneliese Schosshauer in Walln�fer compositions; 1944 Interview with Walln�fer; HERMANN WINKELMANN: Liebesgl�ck (Sucher); Arias from Le Proph�te, Il Trovatore, Dalibor, Die Meistersinger, Lohengrin & Tannh�user - recorded 1900-06. 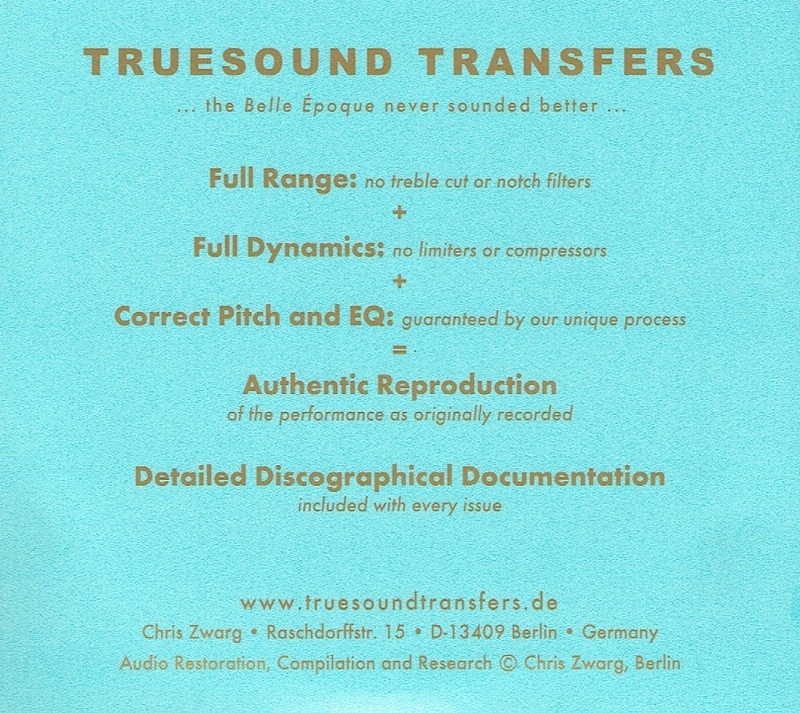 (Germany) 2-Truesound Transfers 4004. 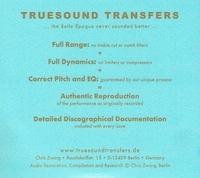 Transfers by Christian Zwarg. �Franz Walln�fer studied composition and piano with Otto Dessoff and Franz Krenn at the Conservatory of the Gesellschaft der Musikfreunde in Vienna, today's Viennese Music Academy. Influenced by his acquaintance with Mathilde Marchesi, he studied singing with Hans Rokitansky and became a member of the orchestra under the direction of Richard Wagner on the basis of his convincing achievements at the age of 18. After that time, he developed into a Wagner specialist, and from 1880 onwards he was also a singer in the opera group of the so-called �Wandering Wagner Theater� under the direction of Angelo Neumann. With this traveling Wagner ensemble, which included a complete orchestra, an opera choir as well as stage equipment and stage technicians, he performed in the next few years at 135 RING performances and over 50 other Wagner concerts in several European cities, also at the Metropolitan Opera in New York. His repertoire included the roles of Tristan, Siegfried and Tannh�user. These concert tours became Walln�fer's great artistic breakthrough. During this period, he also belonged to the so-called �Nibelungen-Kanzlei�, a group with Felix Mottl, Hans Richter, Anton Seidl, Hermann Zumpe, and others who dealt with the interpretation and, above all, the marketing of the various Wagner operas. Beginning in 1885 Walln�fer was given a ten-year contract in Prague. He then took over several engagements both as a singer and as a conductor at various prestigious venues such as the Metropolitan Opera, New York (1895/96), Riga and Breslau (from 1897), Nuremberg and Vienna (from 1900) and Rostock (1905). From the turn of the century, Walln�fer finally settled in Munich, where he continued to work as a composer, teacher, conductor and singer, but also as a theater director (1895-1907), especially for contemporary operas . After 1907 and with increasing age, Walln�fer was mainly concerned with the performance and composition of instrumental music. From 1 March 1933 Walln�fer was a member of the Nazi Party, registered under the number 1.509.075. During the period of National Socialism he composed, among other things, a folk triumph for Volksschor and a large orchestra, 1934-1935 the music drama ILDICHO and 1938 a young girls' suite . In addition, he also appeared for a time as author of music criticism and music literature. He died on 9 June 1946 at the age of 92 years. The focus of his artistic career was undoubtedly the singing. His voice developed over the years from an initial baritone to lyric tenor, then to a radiant heroic tenor. This was particularly beneficial to him in the great roles of Wagner's operas. Since his celebrated success with the �Triumphlied� op. 55 by Johannes Brahms at the 53rd Niederrheinisches Musikfest in Aachen in 1876, he also showed his art in the performance of romantic songs, and he did not forgo any opportunity to put them into his repertoire, also to perform them during special Brahms or Liszt evenings.